Maxol, Ireland’s leading forecourt and convenience retailer has announced mental health charity Aware as its new charity partner. The aim of the partnership, which will run until at least the end of 2017, is to promote positive mental health in communities in Ireland. It will support the range and level of important services delivered by Aware in the Republic of Ireland and Aware NI in Northern Ireland. 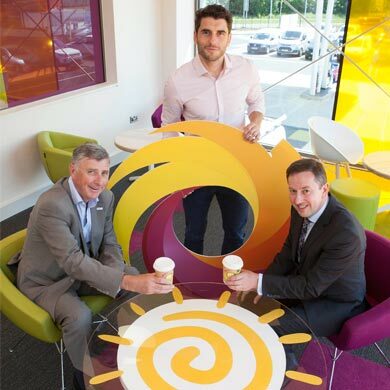 The announcement was made by Maxol’s Chief Executive Brian Donaldson, who was joined by Dublin footballer Bernard Brogan and Aware CEO Dominic Layden at the recently opened Maxol M3 Mulhuddart Services, to officially launch the partnership. As well as featuring Aware collection boxes in Maxol’s 230 locations, the partnership will also support the important issue of youth mental health through Aware’s Beat the Blues schools programme for teenagers aged 15-18. A further key initiative will be Aware and Maxol’s Mood Walks, a series of walks taking place across the country where communities are encouraged to come together to get to know each other, while keeping active and maintaining positive mental health. More details on these activities will be announced shortly. “We’re very proud to partner with Aware, who do such important and admirable work across the country. We have been focussing much of our efforts on community level initiatives of late through our retail network, and this partnership will reinforce that at each of our 230 locations. “Aware is delighted to work with a national, trusted and well known company such as Maxol. Mental wellbeing is a vital foundation for every aspect of life and being able to work with a company which is at the heart of so many communities right across the island is a real opportunity to highlight mental health and wellbeing to all. · The Maxol Group was established in 1920 by William McMullan. The 4th generation of the family are Company Directors. · Maxol makes a significant contribution to the economy on both sides of the border and markets a comprehensive range of oil and petroleum products to the Irish Market, through their Retail, Fuel Card and Lubricants divisions. · The Maxol Group had an annual turnover of €640m in 2015. · The company employs directly and indirectly more than 1,000 people across the island of Ireland. · Maxol has been investing and expanding in recent years and currently has a network of 230 service stations, of which 107 are company owned. · The new food brand Moreish – Fresh Food at Maxol was launched in 2014 and is currently in 31 Maxol service stations and growing. It won ‘Best Oil Company Initiative’ at Ireland’s Forecourt & Convenience Awards 2015. · In 2012, Maxol was voted Retailer of the Year by UTV Business Eye Awards in Northern Ireland. · Maxol was voted the most reputable oil company in Ireland for four consecutive years between 2012 to 2015 by Corporate Reputations independent survey. · Aware is the national organisation providing support, education and information services around depression and bipolar disorder. · Aware provides a range of positive mental health programmes aimed at improving participants’ wellbeing.